Back from KL. Did some shopping here and there. 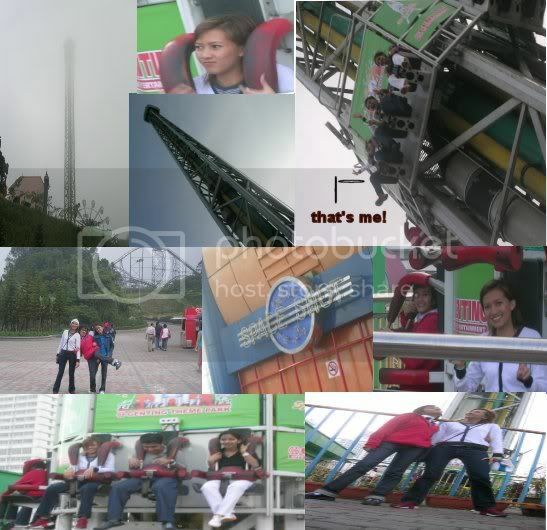 Took the gravity-free-fall Space Shot at Genting theme park twice. Was a Blast. Would love to try bungee-jumping real soon. Weather was a cooling 16-18 degrees celcius there where the smoke-effect comes out of ya mouth as you speak. Cold. Real Cold. Eating BB Hailam Chicken Rice completes the holidaying in KL. I'll be off to Genting and KL tonight at 9.30pm. So, till then. First & Foremost, thanks to FRANSS for the gift of an Esprit shirt and a Dave Pelzer book. Lia, thanks for recommending me that book. I have just finished reading it (in 2 days). It was totally moving and mind-blowing. Thanks to you, i'm gonna get "The Lost Boy" and "A man named Dave". BF is now sleeping soundly at home.... Ssssshhhhh. :) I Miss him a lot. This song is nice... but it has nothing to do wit SheZai k, hahaha! Bought Darling a Beastie Boys CD just for fun, out of the blue. Heard he's been a fan. Well. Enjoy Dear. BF's working the mid-shift today. He's been active at work having fun selling Nike hitting sales targets. :) That's just superb! I'll be going on a holiday wit my whole extended Family come Tuesday night. 3 or 4 days. Nowhere far. Genting and KL is the destination. Gonna miss my BF a lot. Gonna miss our 39-mth anniversary by a day. Keepin hopes high, don't worry yea BF, We'll fo sure celebrate it soon. *Wiinnkkkss*! I had a great time with BF today. We watched Harry Potter and i like fantasy, magical shows cuz of the special effects so i give it 4 popcorns~!!!! Unfortunately, i can't say the same for BF... for he was caught by me with his eyes closed and asleep halfway through the show..hhahhahaha!! He must be so tired from work. Hmmm... talking about work, the interview went horrendously, horribly SO not well. haha~! But i hope to learn from experience. So for now, i think i'm gonna keep on lookin' hi and lo for a job that fits me. But right now, I wanna ENJOY! School-free life. 3lions one goal up! yippeee!! But then.. Only till 90th mins....Boo hoo....Anyways both team played great with France having better chances. Henry & Pires was closely closed down but Zidane is too hot! & that gives Makalele & Viera to roam about freely. My bet for the poor player from the England camp would be liverpool duo Gerrard & Owen. Gerrard can't really cope with the pace of the French midfielders & as for the latter, he absolutely nothing upfront. Best player for them? Definitely Wonderkid Rooney & Lampard. - I have a new pc, same like BF's. - I have just ended my last of the last of the last exam paper today. Alhamdulillah. - It was a killer paper. My morale droops deeper. - I am not ready for a transition into the dog-eat-dog world of business out there. - I am offered another job interview happening in 10 hours time. Next one is in 36 hours time. - I am not ready. - I think i heard my hamster fart this morning. I'm going through quarter-life territory now! I had such a wonderful time at my cousin's wedding. Once again i'd like to wish Raudha and Aminor a very happy and blissful marriage till eternity. They're back from their honeymoon at Phuket and i'm sure they've enjoyed themselves there! Today marks my 22nd birthday. Oh Boy. Oh My. I feel super-duper good today. Firstly because my Exam paper today is such an easy one that i'm confident of gettin 1st class marks. And secondly, just after i finish my exam paper around 1+pm, somebody called me up and told me i got a Job Interview at N.G.& Associates as a Management Executive. Oh Wow. My First Job Interview! However, nothing beats how my BF is such a Pure Darling to me! Knowing that i'm studying for my exams these past 2 days, we decided not to go out. *That's very understanding of you Honey. * So i was cramming my brains at home for 2 exam papers in a row and by no means have i any idea what's in store for me. It was about 4pm on Wednesday Afternoon when BF msg me and said,"Honey, i hope i can help you by boosting your confidence level in your exams, but how eh.. hmmmm... anyway, i'm under your block now. Can you come down?" ok i was so surprised. (he came down all the way from Clementi to Tampines just to meet me and surprise me.) So i rushed down and there he was with a plastic bag of his Mom-Made Mee-rebus and another Nike Plastic Bag. We decided to head to Tampines Mart for ice-cream. He then handed me the Nike plastic bag with a present all wrapped up in it. He told me he got me something from Nike as a birthday gift since he's working there. Ok, i am so glad to just see him! I opened up the present and got the shock of my life. He had playfully bluffed me! 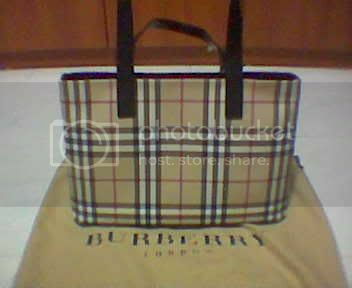 There lay a Burberry's Bag. With a card that says," This is something for your future!" on it. I'm speechless AND STILL am. Thank You my Honey. I didn't expect it. I Love You. She's Born at 0040 4th June 1982..
We had the greatest of time today! Gave the feast treat at Cafe Cartel, Watched the most anticapting movie for me,Shrek 2! haha Simply GREAT! Oh yea we did a lil shopping shortly after that. Working again tomorrow Am shift. Going to meet Ex-colleagues for dinner @ Cafe Viena. Hope it'll be fun!